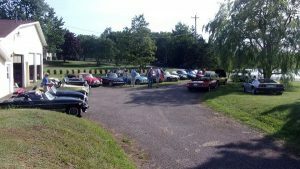 …“Meet and greet at least 20 cars and 40 people. 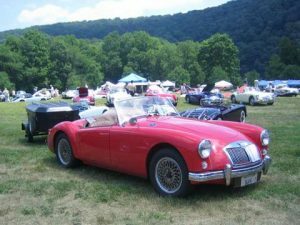 Hiding in the photo below, 5th car from left, next to my MGA, is a resident MG TC. In the garage an MGB and MG TD. On the lift was another MG TD in final stages of reassembly after full restoration. Turning our back on the prior row of cars we found a Jaguar XJS (V12) and another Jaguar drop head coupe. But my prize find of the day was the rather rare (this side of the pond) Austin 1800-MK-II. Thinking of sport coupes, there was the well-known Austin Cooper (Mini), and the slightly larger Austin America (which I used to own), and the next step up is this Austin 1800. Gotta smile, nice car. I was surprised to find how many people in this neck of the woods already knew about us. Someone had fired a warning shot, and they knew we were coming. When the party was breaking up about a dozen die-hards remained to chat until a while longer. Then I borrowed time on the resident computer to make a ferry reservation for next day, after which we had an invite to stay overnight at another friend’s place a few miles away (closer to the ferry terminal). After a late night chat, somewhere well past midnight I was catching up these photos and notes, but we do have to get up in the morning. Zzzzzz.